July 9, 2016 – NECW: Toxic defeated Christina Marie. September 15, 2017 – Dynasty: Christina Marie defeated Kennedi Copeland and Skylar in a 3-way match. October 21, 2017 – ECWA: Karen Q defeated Christina Marie in the 1st round. November 17, 2017 – Dynasty: Jawsolyn defeated Christina Marie. December 16, 2017 – PPW: Allie Recks defeated Ariela Nyx, Christina Marie and Sammi Pandora in a 4-way match to retain the women’s title. January 27, 2018 – PPW: Allie Recks defeated Christina Marie to retain the women’s title. 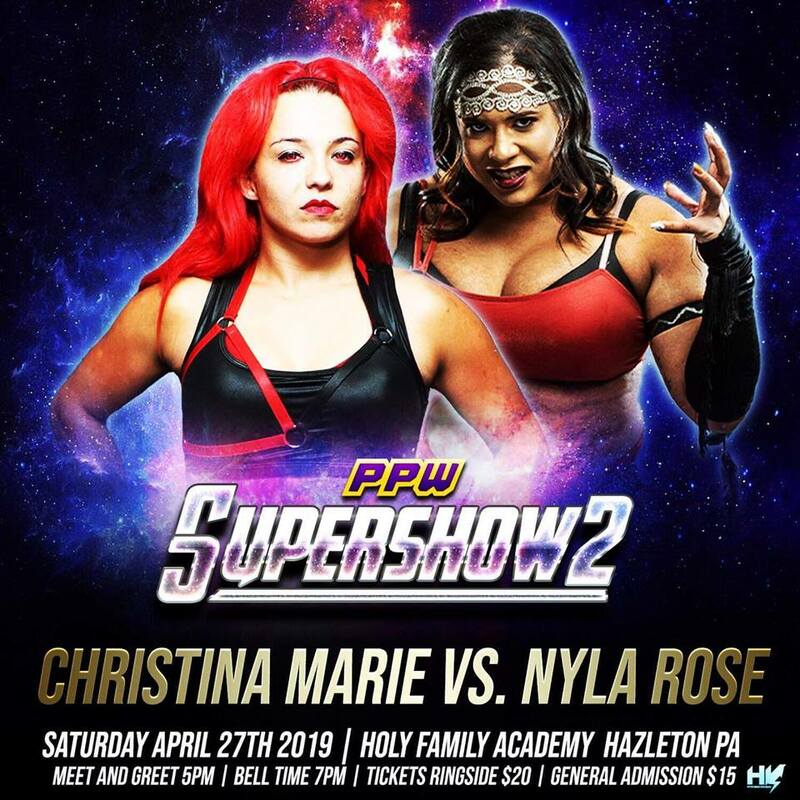 February 17, 2018 – PPW: Christina Marie defeated Corinne Mink. February 24, 2018 – Dynasty: Christina Marie defeated Tasha Steelz. March 10, 2018 – MAW: Christina Marie defeated EKW, Jody Threat and Sabrina Kyle in a 4-way match. March 11, 2018 – Pro Wrestling Takeover: King Leon defeated Christina Marie. March 17, 2018 – PPW: Allie Recks defeated Christina Marie to retain the women’s title. April 14, 2018 – WOW: Nikki Addams defeated Christina Marie to retain the women’s title. May 12, 2018 – Excellence: Christina Marie defeated Jessie Mack in a dark match. May 16, 2018 – BBWF: Jasmin defeated Christina Marie. June 2, 2018 – Dynasty: Christina Marie defeated Davienne. June 16, 2018 – ECWA: Christina Marie defeated Sammi Pandora to retain the women’s title. June 23, 2018 – PPW: Christina Marie defeated Blue Pants. June 30, 2018 – Dynasty: Christina Marie defeated Kennadi Copeland. July 21, 2018 – PPW: Christina Marie defeated Miss Jasmine and Riley Krowe in a 3-way match. August 18, 2018 – PPW: Miranda Vionette, Ryan Race and Sammi Pandora defeated Christina Marie, Ray Lyn and Trish Adora. August 25, 2018 – Dynasty: Christina Marie defeated Jordynne Grace to retain the Diamonds title. September 8, 2018 – PWX: Christina Marie defeated Luscious Latasha. September 15, 2018 – PPW: Miranda Vionette defeated Allie Recks and Christina Marie in a 3-way match to win the women’s title. October 6, 2018 – NAW: Christina Marie defeated KC Navarro. October 20, 2018 – PPW: Christina Marie defeated Miradna Vionette to win the women’s title. November 3, 2018 – UPW: Christina Marie defeated Dewey Murray. November 9, 2018 – PWAD: Danny Demanto and Penelope Ford defeated Christina Marie and Serpentico in a no disqualification tag team match. November 10, 2018 – Excellence: Christina Marie defeated Ryan Wright. November 17, 2018 – PPW: Tessa Blanchard defeated Christina Marie by disqualification. Marie retains the women’s title. December 1, 2018 – ICW: Christina Marie defeated Ariela Nyx. December 8, 2018 – Excellence: Christina Marie defeated Miss Jasmine. 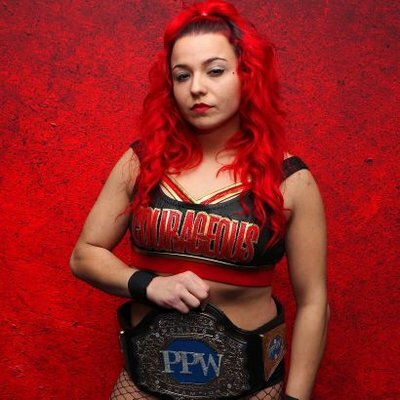 December 15, 2018 – PPW: Christina Marie defeated Allie Recks to retain the women’s title. December 15, 2018 – SHINE 55: Shotzi Blackheart defeated Christina Marie. January 5, 2019 – WXW C4: Mike Orlando and Allie Recks defeated Johnny Moran and Christina Marie. January 12, 2019 – NYWC: Riley Shepard defeated Christina Marie, Corinne Mink and PJ Gonzalez in a 4-way match to win the vacant women’s title. February 8, 2019 – PWAD: Scarlett Bordeaux defeated Christina Marie and Penelope Ford in a 3-way match to win the SAW women’s title. February 9, 2019 – PPW/Impact Wrestling One Night Only: New Beginnings (Taped): Scarlett Bordeaux defeated Christina Marie. February 16, 2019 – PPW: Christina Marie defeated Veda Scott to retain the women’s title. If Christina Marie could contact us to send more match results would be greatly appreciated.